It is two minutes and fifty-three seconds of simple, but remarkably effective storytelling. A silver-haired man, dressed in a dark sport coat, walks through the streets of Norman, an unpretentious American town in the heart of Oklahoma. As he slowly meanders down the city streets, he recites a poem in his measured, slightly raspy voice. The first verse describes a frazzled gentleman who, upon visiting a friend, begins to open up about his latest difficulties. If not for its business slant, like worries over “negative cash flow,” it would be easy to confuse the nuanced lines for those of Robert Frost. Eventually, the friend he’s come to see changes his fortunes. Now, he has systems “designed with vision and purpose” that provide better insight into his operations. He and his wife start doing more travelling, thanks to generous dividend checks. So it is that McMahon Marketing helped its client, a local business coach, address one of its biggest challenges: a lot of prospects simply don’t know what these coaches do, or why they need one. “Small business owners feel isolated and stressed and believe others are thriving while they’re failing,” says CEO Korey McMahon, whose U.S.-based agency produced the video ad. The resulting work, entitled “The Owner & The Coach,” earned McMahon’s agency a Gold Stevie Award for best Service Sales Video in The 2017 American Business Awards. A big part of the ad’s appeal is its stripped-down, authentic vibe. It stars the client himself, Martin Holland, who intones a poem he originally wrote while taking his dog for a walk. In it, Holland, who works for Las Vegas, America-based ActionCOACH, finds a way to demystify his industry, turning the business owner-coach relationship into a uniquely personal interaction. McMahon saw Holland’s rhyming verse as the perfect way to get his client’s message across. With a budget of just $1,000, he enlisted a local film director, Cooper Williams, to turn it into an ad. Already, the video has been having a big effect. Holland says he recently spoke with two business owners in northeast Oklahoma who are perfect examples. The husband saw the need for a coach to help revitalize the company, but his wife was hesitant. The spot is also a huge shot in the arm for McMahon Marketing, a five-year-old inbound marketing agency with a staff of just seven full-time employees. Despite their lean budget, they were proud to win the Gold with several multinational firms with billions of dollars in revenue as their competition. “It’s so important for not only our credibility, but also the talent we recruit,” says McMahon. “I feel we have the most talented team around, and this is just validation that we are creating nationally recognized videos and marketing services,” he said. The 13th Annual International Business Awards, the world's premier business awards competition, which attracts nominations from organizations in more than 60 nations and territories each year, is currently accepting entries through July 13. This is the extended final entry deadline this year. Today we will highlight the Video Awards Categories. These categories recognize excellence in videos produced for a business- or work-related purpose that were first released or otherwise made public since January 1, 2015 . We prefer that you submit your video online. However, if you will submit your video on DVD for review by the judges, you must first submit your entry information online. Then print out a copy of your entry and mail it with one (1) copy of the DVD to: The Stevie Awards, 10560 Main Street, Suite 519, Fairfax, VA 22030. U.S.A. When most people think of business awards, they might invision recognition only for executives or huge companies. In the Stevie Awards' programs, this is not the case. Creative awards categories for organizations of all sizes are offered just as much as the more mainstream company or executive categories. Today we would like to recognize the judging chair and committee who will review the 2016 American Business Awards Video Awards nominations. The Video Awards categories range from Best Branded Entertainment Video to Best Sales: Technology video. There is still time to submit nominations in The ABAs. If your video is award worthy, review the entry kit here. The extended final entry deadline is April 19. These video award categories are also some of the most simple to enter because the videos comprise most of the entry. See more about the Video Awards judging chair and committee. Jason is passionate about building strong brands and intrigued by the power of great marketing. He has helped build outstanding brands in a variety of industries and his work has won six Stevie Awards. He recently started his own consulting practice, 2Ten Consulting. With 25 years of industry experience, Stan is expert in the creative development and production of TV commercials, PSAs, corporate and website videos, and films. His projects have been recognized with awards of excellence and shown at prestigious venues in the U.S. and internationally. Stan earned his B.F.A. in Cinema at the University of Bridgeport. Since 2010, Molly has spearheaded Cigna's Informed on Reform brand, delivering communications and consulting services across all internal and external stakeholders. Prior to taking on this role, Molly led a communications and engagement team at Cigna. Before joining Cigna, Molly worked in communications for Definity Health, and at HealthPartners, where she started her career. Adriana Toledo is the Director for Brand Marketing and Food& Nutrition Practices at Ketchum Brazil. 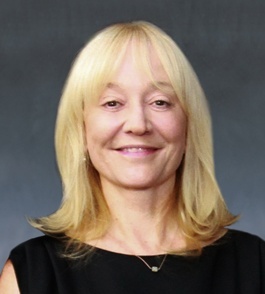 She brings over 20 years of experience in the corporate communication, developing important public relations projects for national and international companies. Adriana graduated in Journalism, with specialization in Brand Marketing and Communication focused on Food and Nutrition. In 2012, she became a member of the Ketchum Global Brand Marketing Council. We thought it would be helpful for communications professionals if we highlighted the top four reasons to submit entries to the 2013 ABA video awards categories. There are dozens of video award categories to choose from and videos are not limited to only one category. Your organization can submit as many entries as applicable! If chosen as a Stevie Awards winner, your organization’s video will be recognized in an awards ceremony and receive acknowledgment via press coverage and our radio cast and Internet streaming. Our corporate video categories are among the most reasonable. See all entry fees here. If you wish to submit your video offline, on DVD, for review by the judges, you must first submit your entry online. Then, print out a copy of your entry and mail it with one (1) copy of the DVD to: The Stevie Awards, 10560 Main Street, Suite 215, Fairfax, VA 22030. Wednesday, 27 June, is the final entry deadline for The 2012 (Ninth Annual) International Business Awards, the world's premier business awards competition. All individuals and organizations worldwide may submit nominations to the IBAs. If you haven't already done so, you can request your entry kit here and you will receive it right away. We thought it would be helpful for communications professionals if we highlighted four reasons to submit entries to the 2012 IBA video awards categories. An essay of up to 100 words describing the video's purpose and results to date. The video itself, in the form of an attachment or a URL, which you must attach to your entry through our attachment/link uploading tool. Optionally, you may list creative and production credits for your work - a list of the people and organizations that contributed to its development. Today is the final entry deadline for The 2012 (10th Annual) American Business Awards, the premier business awards program in the U.S.A. If you haven't yet done so, you can request an entry kit here and you will receive it right away. We thought it would be helpful for communications professionals if we highlighted the top three reasons to submit entries to the 2012 ABA video awards categories. 2012 ABA Finalists will be announced mid-May and the 10th Annual award winners will be announced at our traditional banquet on June 18th at the Marriott Marquis in New York City. Want more ways to highlight your organization's efforts? We have several corporate awards categories that may be of interest including: app awards, live event awards, and website awards. 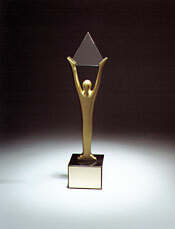 Turk Telekom of Istanbul, Turkey, won a Stevie® Award for Non-Profit Fund Raising in the video awards categories of The 2011 International Business Awards, the world's premier business awards program. (The 2012 IBAs are now accepting entries. Download your entry kit here and begin submitting your entries by the 16 May entry deadline.) Here we look at how Turk Telekom conveyed their commitment to employees through their video of the year. The 2011 video award winner is a leading communication and convergence technology group in Turkey which provides its customers with integrated telecommunication services from PSTN and GSM to broadband internet. With nearly 30,000 employees all over Turkey, the organization wanted to set up an insurance system in order to provide the security of social welfare and health care coverage for its nationwide workforce and their loved ones in Turkey. In order to best serve their workforce, the corporate video award winner created the Health and Welfare Foundation. Although set up as a charitable organization, the Foundation aims to provide its policy holders with a wider range of services than those of private insurance companies in addition to top quality health and social welfare support. Türk Telekom Group is a leading communication and convergence technology group in Turkey which provides integrated telecommunication services including PSTN and GSM to broadband internet. Turk Telekom has nearly 30,000 employees all over Turkey. Türk Telekom group companies have 16 mn Fixed Access Lines, 6.7 mn ADSL Connections and 11.6 mn Mobile Subscribers. To learn more information, visit www.turktelekom.com. Showcase your organization’s business-related films by submitting entries in the video awards categories of The 2012 International Business Awards, the world's premier business awards program. (We are now accepting early-bird submissions with discounted entry fees through 11 April. If you can't make April's deadline, the entry deadline is 16 May and we will continue to accept late entries through 27 June; get your entry kit here.) Our corporate video competitions recognize excellence in films or videos first released or otherwise made public since January 1, 2011. Starting in 2012, as part of our 10th anniversary celebration of the start of the Stevie® Awards movement, all video award entrants will be eligible to participate in our first international business award celebration with our three levels of award distinction: gold, silver and bronze. The top scoring qualifying entry in each category will receive a Gold Stevie Award. Finalists that receive a final average score of at least 8.0 out of a possible 10 will be designated as Silver Stevie winners. All other Finalists will be designated as Bronze Stevie winners. Learn more here. 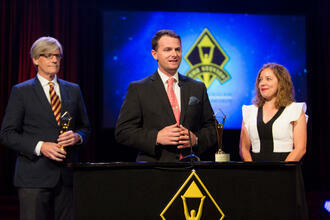 If chosen as a Stevie Awards winner, your organization’s video will be recognized in an international awards ceremony. Your organization will also receive acknowledgment via press coverage and our radio cast and Internet streaming. Our video awards and film awards categories are flexible to give you more options and increase your chances of winning a Stevie. Your organization can submit as many entries as applicable. Our video award categories have some of the lowest entry fee costs. See all entry fees here. Leave us a comment and let us know which video you'll be submitting in the 2012 IBAs. Paycor of Cincinnati, Ohio, USA won a Stevie® Award for Best Motivational Video in the video awards categories of The 2011 American Business Awards, the premier business awards program in the U.S.A. (The entry deadline for the 2012 ABAs is March 28, request your entry kit here.) Here we look at the inspiration behind Paycor's "Payrollin" video. The 2011 video award winner is one of America’s largest independent providers of payroll and HR services. With nearly 20,000 clients, Paycor has offices in 20 major U.S. cities and customers in all 50 states. As a full-service payroll and human resources company, Paycor services include tax filing, direct deposit, 401(k) retirement services, time and attendance and more. Founded in 1990, Paycor offers award winning payroll services. Headquartered in Cincinnati, the company offers a comprehensive suite of payroll and human resource management solutions to thousands of clients across the USA. With over two decades of experience, the company strives to meet the needs to every client through its dedication and implementation of new products and services. To learn more, visit http://www.paycor.com. Highlight your organization’s outstanding business related videos by submitting entries to The 2012 American Business Awards℠. (Entries are now being accepted. Get your entry kit here.) Our video competitions recognize excellence in videos first released or otherwise made public since January 1 2011. Our video competitions categories are among the most reasonable. See all entry fees here. a. An essay of up to 100 words describing the video's purpose and results to date. c. Optionally, you may list creative and production credits for your work - a list of the people and organizations that contributed to its development. Awards in all of these categories will be presented at the ABA's traditional awards banquet in New York on June 18. Learn more about the event here. Which categories apply to your organization’s business related videos?